As soon as the weather begins to turn cooler, we immediately begin to make a variety of soups in our kitchen. We will use our Instant Pot to make our famous Healthy Chicken soup recipe as soon as there is a sign that someone is getting sick in the house. A delicious bowl of white chicken chili topped with cheese, sour cream and cilantro! The delicious homemade chicken broth is filled with herbs and veggies and shredded chicken breast to make anyone feel better. And then there is our Loaded Baked Potato soup. This recipe often gets requested as a comfort meal on those cold and damp days where you just can’t seem to warm up. And of course, on game day, you can bet there will be a pot of chili in the Instant Pot waiting for half time to be devoured by the fans. But sometimes you just need something a little different and White Chicken Chili is just the answer! I first had white chicken chili at a campground on a cool autumn day. It was in a cast iron kettle hanging over a camp fire and had been cooking since early morning. 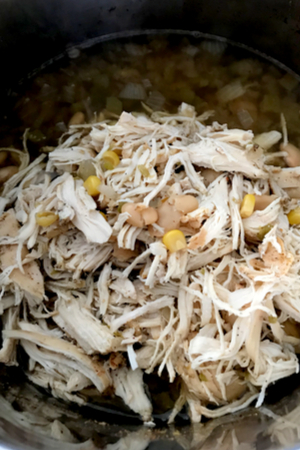 I used the slow cooker option of my Instant Pot to make this white chicken chili. By mid-afternoon the aroma of a perfectly cooked soup filled the campground. I could hardly wait to try this type of chili that I had never had before. I lifted the lid off the kettle and dipped the soup ladle deep into the center of the pot. One quick stir and I filled my bowl of creamy white chicken chili. 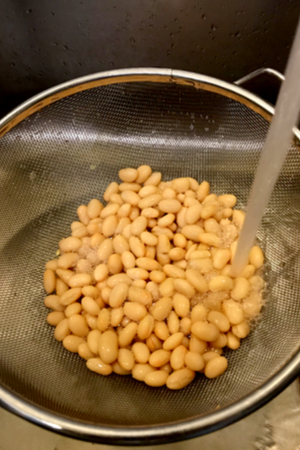 It is important to drain and rinse your white northern beans. It looked and smelled absolutely delicious! I wanted to take a bite right away, but the steam coming off the bowl warned me that I better let it cool for a minute or two. Once I finally got to taste the white chicken chili, I could hardly believe my taste buds. The creamy texture of the soup was filled with amazing flavors. Everything is in the slow cooker and ready to be cooked. 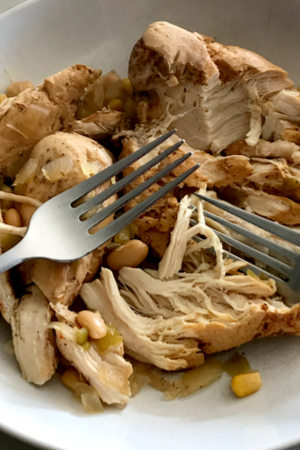 Perfectly tender shreds of chicken were complimented by kernels of sweet corn and white northern beans. And there was a little bit of heat in the soup courtesy of green chiles and jalapeno peppers. I knew right then that this would be a recipe that I would have to recreate at home! Once the cook time is up, remove the chicken and it will easily shred with two forks. I pulled out my slow cooker and got to work! After a few attempts at tweaking different recipes, I finally came up with the perfect combination that has now become my famous White Chicken Chili recipe. And by famous, I mean that it has literally won several chili cook off contests! Place the chicken back into the pot and add the cream cheese and cream to finish it off! Everyone loves it so much that I hardly make my classic red chili recipe anymore. 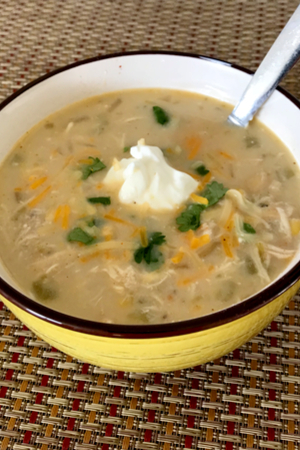 Every time I try to, my friends and family plead me to make this White Chicken Chili recipe instead! 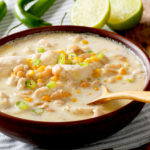 Creamy and delicious white chicken chili that is full of flavor and filled with just the right amount of heat that will leave your taste buds wanting more! Add the salt, pepper, cumin, oregano, chili powder, and cayenne pepper on top of the chicken. 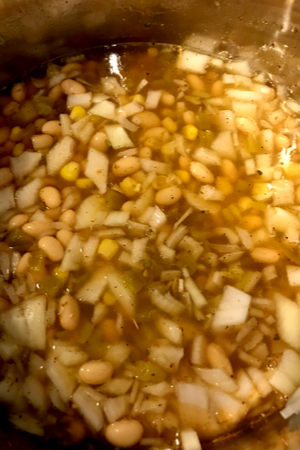 Add in the onion, garlic, great Northern beans, green chiles, jalapeno peppers, corn, chicken broth and cilantro and stir to combine. Cover and cook on HIGH for 3-4 hours or LOW 6-8 hours. **Instant Pot Crockpot setting – MORE for 4 hours. 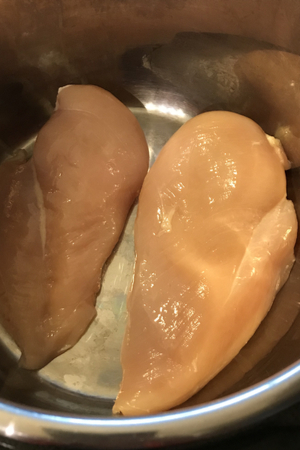 Once the time has expired, remove the chicken breasts to a large plate. Shred the chicken with two forks and return the meat to the slow cooker. Stir in the cream cheese and heavy cream. Continue to cook on HIGH for 15-20 minutes until cream cheese has completely melted. Prior to serving, stir well and serve. Top with additional cheese, sour cream, diced jalapenos, avocado slices and/or tortilla strips. ← Instant Pot Caramel Recipe – Only 1 Ingredient!